If you’ve ever experienced the therapeutic effects of essential oils such as lavender, chamomile or peppermint, then you’re probably well aware of the powerful, relaxing and calming states they can induce. 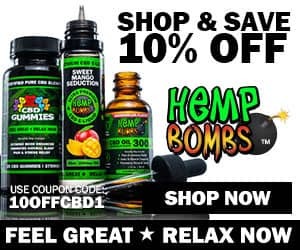 Now imagine the benefits of aromatherapy coupled with the medicated effects of cannabis! 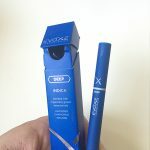 Evoxe Laboratories has innovated the first-ever, all-in one, disposable vaporizer that combines high quality CO2 extracted cannabis oils infused with high quality blends of essential oils. Cannabis terpenes that are typically lost with the CO2 extraction process are reintroduced with terpenes of organically grown essential oils. These oils compliment the natural cannabinoids in cannabis, producing a pleasant medicated experience. Each Evoxe includes one disposable vape pen that is fully-charged and pre-filled with 0.5 ml of pure cannabis oil, blended with essential oils. 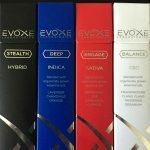 There are currently four different strains of Evoxe vapes which all have their own specific essential oil blends and associated mood inducing effects to accomodate your individual needs. 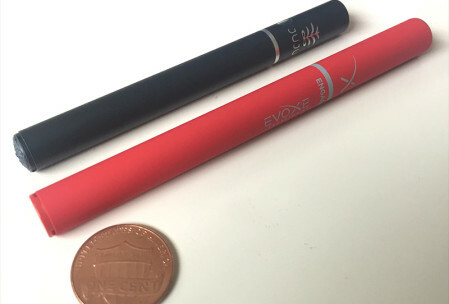 The Evoxe is quite small, but still slightly bigger than a JUJU Joint disposable vape. The vape is nicely weighted, and wrapped with a silky material which feels and looks great in your hand. 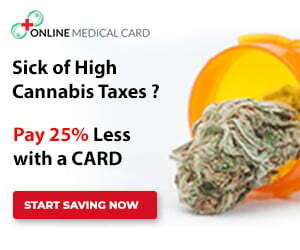 The design is discreet and does not resemble any cannabis branding. Definitely a quality engineered vape – especially for a vape that’s disposable! Puffing on the Evoxe produces a truly unique experience as you can taste the cannabis with hints of essential oil aromas. 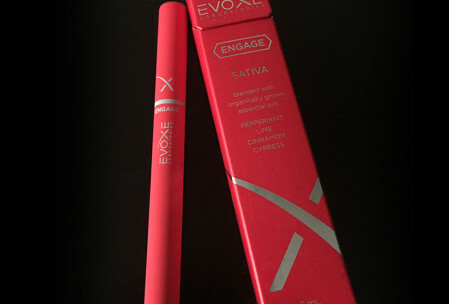 Among our favorite Evoxe vapes are the Engage (Sativa) vape for its taste and flavor and the Deep (Indica) vape for its potent relaxing effects. The Engage has nice blend of oils that are great daytime flavors for awakening and stimulating the senses throughout the day. The Deep vape is blended with lavender, chamomile, and orange – a brilliant concoction to relieve the stresses of the day at bedtime. The Evoxe vaporizer is extremely easy to use as it is fully charged and ready to go right out of the box. Simply put your lips around the filter tip and inhale, taking a short puff for about one or two full seconds, hold breath for another two or three seconds, then exhale. Wait several minutes to experience the full effect before deciding if additional puffs are necessary to achieve the desired effect. 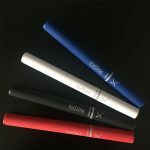 Unlike the JUJU Joint disposable vape, Evoxe vapes deliver up to a 3-second puff before it reaches the maximum temperature and cuts off (JUJU Joints cut off at 5-7 seconds). This actually makes for a good length of a drag to enjoy the floral notes and anything beyond that might cause throat irritation. 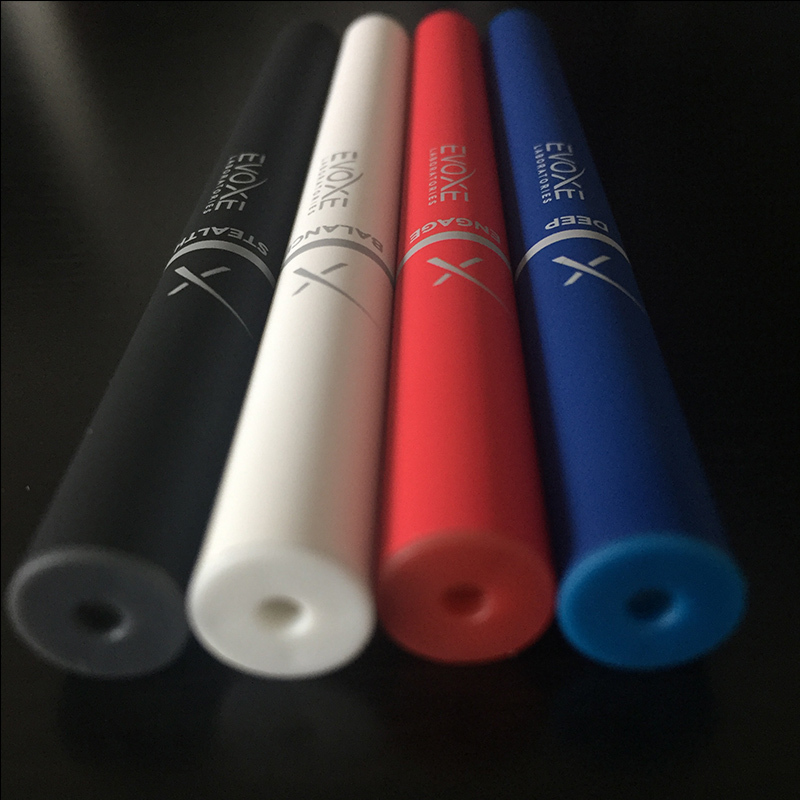 The Evoxe does require a harder pull than other disposable vapes we’ve tried, but we tend to get consistently good hits. If you’ve ever been around essential oils like lavender and peppermint, you’ve surely experienced their powerful scents. When you first puff on an Evoxe vape, you might be caught a bit off-guard as you are probably familiar with these oil scents in the air, but not tasting them! It does take a bit of getting use to but then it becomes a delightful flavoring, slightly masking the typical cannabis taste/smell. 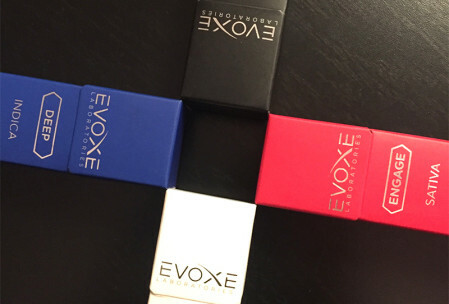 We had the opportunity to try the full line of Evoxe vapes. For our specific needs, the Deep (Indica) and Engage (Sativa) vapes were both a pleasure to experience. The Deep which has lavender (associated with stress-relief and calming properties) worked wonders to put the mind at ease for bed time. Evoxe vapes typically retail between $40-$60 for a single vape. Each fully charged vape will last about 150-200 puffs and contains around 350-400 mg of THC. 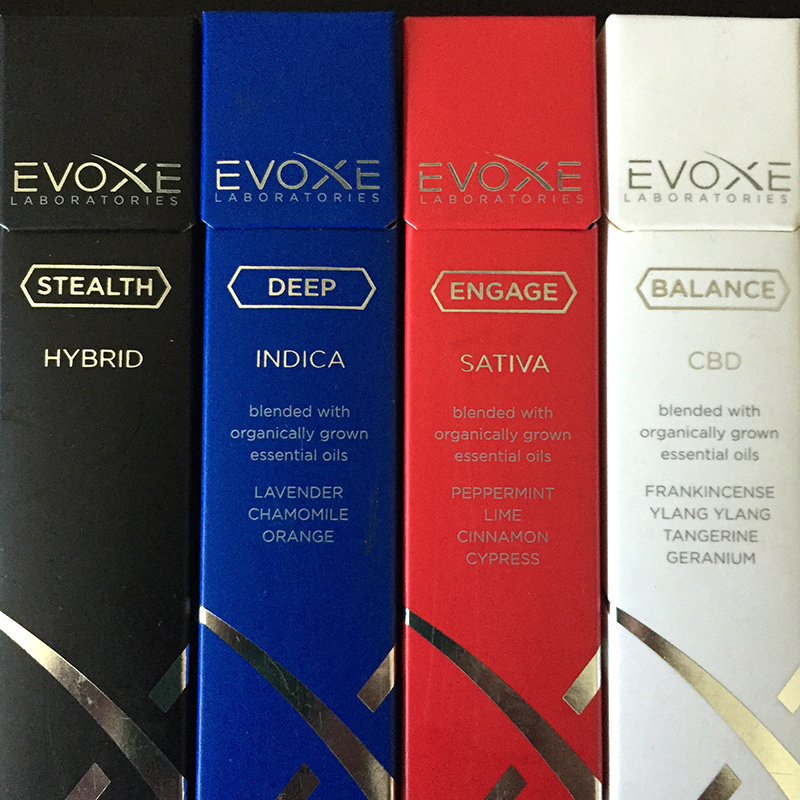 Evoxe vapes are available at more than 50 dispensary locations and delivery services throughout California. The CBD Balance (THC-free) vape is currently available directly through the Evoxe website and in MMJ clinics in Oregon and Arizona. If you’re in Los Angeles, Evoxe vapes are available for same day delivery through KushFly online collective and MedMen in West Hollywood.